Please call owner Tim at 718-816-7138 or 917-685-6103. This is my personal fishing machine. Have no time to use anymore. Great boat at this price. I have a 1999 Bayliner Trophy walk around cuddy hard top with twin 175 hp mercury outboards and a Float on aluminum I beam trailer. I have owned this and used it in Raritan and Jamaica bay and offshore for about 10 years . I did not use it much last year due to time restrictions which is why it is for sale now. It has many options including radio, gps, salt and fresh water washdown, anchor winch, fridge, stove, shorepower, battery charger, live well, fish boxes and a clean head for the women. 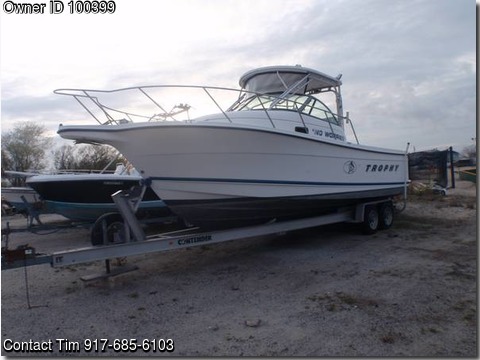 This is a great fishing/family cruising boat at less than half the price of a Grady or Proline. Lots of extras,paint the bottom and go. call for more details. make offer.